Its pyramid shape and dense evergreen foliage make Douglas fir a favored Christmas tree, both indoors and outside. If you have a large property, this type of fir is an impressive specimen tree. A stand of two to three trees adds the dimension of great height, drawing the eye across a broad expanse of lawn and upward. As a border hedge, Douglas fir creates an effective screen along a distant property line. Douglas fir (Pseudotsuga menziesii) grows in U.S. Department of Agriculture hardiness zones 4 to 6 and is the official state tree of Oregon. Cones deck the boughs of Douglas fir with natural beauty. Identify a planting location where the Douglas firs' mature height of 60 to 70 feet will not interfere with overhead wires and nearby structures. Allow a minimum clearance of 20 to 30 feet from the house, fences and other structures, including sidewalks and driveways where the trees' largest roots can cause the flat surfaces to buckle over time. Plant 2- to 3-foot-high containerized or ball-and-burlap wrapped trees in well-drained ground, avoiding areas where standing water accumulates or where layers of stone lie beneath the top soil. For a grouping of two or more trees, or to plant a hedge row, allow a minimum spacing of 15 to 20 feet between the young Douglas firs. Place each tree in a hole 2 feet deep and 3 feet across, loosening and spreading the roots before backfilling with dirt. Tamp down the dirt after each 6-inch layer of soil is added to remove air pockets. Water newly planted trees promptly, soaking with an open garden hose or multiple buckets of water until the surrounding ground is moist. Continue watering trees weekly during the first year, except for periods when rainfall is sufficient to keep the roots moist. During the second and third year after planting, continue routine watering when the top inch of soil becomes dry. Thereafter, established trees need supplemental watering only during extended periods of drought. Prune the tips of a young tree's branches only if necessary to maintain the pyramid form. When Douglas fir trees are more than 5 feet high, you may cut the lowest branches off flush with the tree trunk using a pruning saw. If you elect to grow a flat-sided, flat-top Douglas fir hedge rather than allowing the trees to soar naturally, use hedge shears to manicure the outer edges and a chain saw to periodically cut back the trunk tops. Inspect the trees routinely for pests and disease. Spray smaller trees with a direct stream of water from a garden hose nozzle to remove minor infestations of mites, aphids and caterpillars. 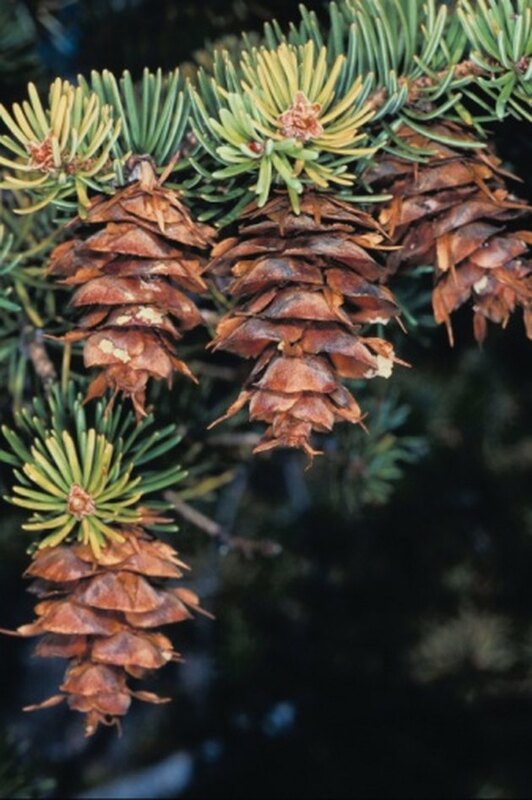 Contact your county extension agent or regional U.S. Forest Service office for instructions on how to treat a major infestation or if the tree's needles begin to yellow and drop.